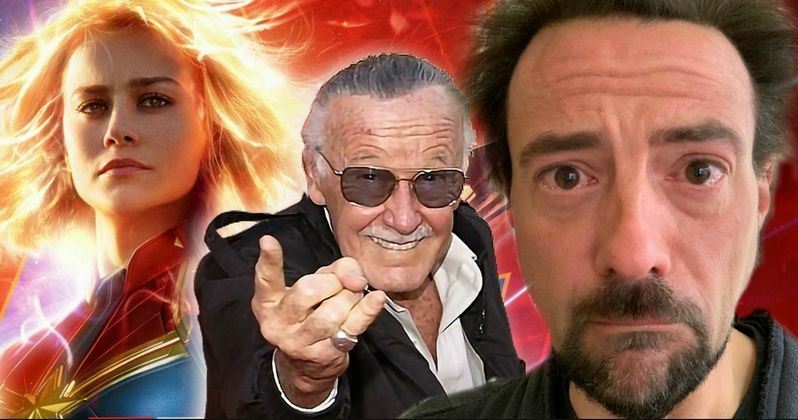 Captain Marvel made Kevin Smith cry. That shouldn't really come as a surprise to anybody, but this is a different situation this time around. There are SPOILERS for Captain Marvel below, so don't read ahead if you haven't seen the movie yet. Smith is now officially a part of the Marvel Cinematic Universe, thanks to the Stan Lee cameo written by directors Anna Boden and Ryan Fleck. In the Lee cameo, the comic legend is sitting on a train reading a script for Smith's Mallrats, which he also had a cameo in, reading his lines when Carol Danvers comes up to him and gives him a smile. Kevin Smith knew about his shout out in Captain Marvel ahead of time, but he had yet to see it on the big screen until yesterday. The writer/director posted a picture of his face, fresh with red eyes and tears from seeing the movie for the first time. While Smith is extremely happy about the cameo, he does have a pretty important question, which you can read below. "Just saw Captain Marvel. I am a blubbering mess. After a lifetime spent referencing the movies, the movies just referenced me! Many thanks to Marvel Studios and to my friend Stan Leefor the shout-out! But if I'm now part of the Marvel Universe...Did I survive The Snap?" It must be pretty surreal for Kevin Smith to see his work in a MCU movie. As he says, he has spent a life time throwing Marvel and other comic book nuggets in his movies. So, to have Mallrats included in one of the biggest entertainment franchises in the world must be huge. But, did he survive the Decimation at the conclusion of Infinity War? Thanos was able to wipe out half of the universe's population with the Decimation. From the footage that we have seen from Avengers: Endgame, the world looks pretty bleak, which could mean that Kevin Smith is not around to spread comic book joy. Marvel Studios has not confirmed whether or not Smith was Decimated, but we may find out how he and the rest of the population, including some of our favorite superheroes, are brought back to life by the time that Endgame concludes. Kevin Smith brought Stan Lee into Mallrats way before comic books were even close to being deemed cool by mainstream audiences. Some would even go as far as to say that Smith pioneered the Lee cameo for the upcoming Marvel movies that came later. Should a Smith cameo be included in every MCU movie from here on out? That's a pretty heavy debate, but it could be a cool way of passing the torch and keeping the memory of Stan Lee alive. You can check out his reaction to Captain Marvel and his inclusion in the MCU below, thanks to Kevin Smith's Twitter account.